If ever a man evoked positive reaction through his own enthusiasm it was Winston Churchill. This enigmatic politician who steered Britain to victory in WWII is credited with more famous quotes than seems fair. 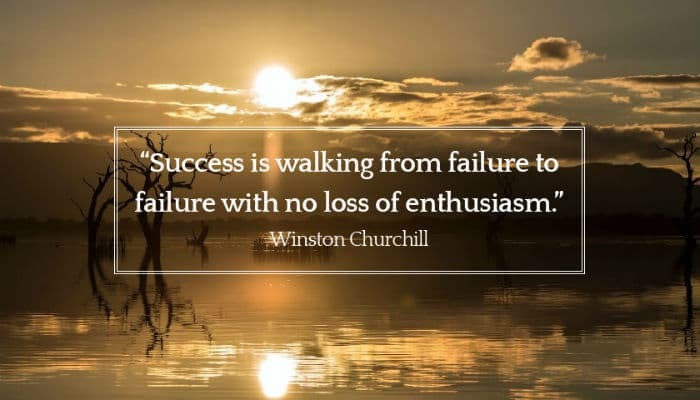 There were many lives lost during this time, and many set backs, yet thanks to Churchill's words the country remained optimistic and were the eventual victors. This is a message that many could do with taking on board and trying to apply to their own lives. These awesome business ecards are a brilliant way of getting that message across to somebody who feels they are doomed to failure. The image is of a striking sky at dawn, the start of a new day. The words of Churchill sit against this backdrop “Success is walking from one failure to another with no loss of enthusiasm”. Keeping focussed on the bigger picture, or the end result, is the point of this message, and we all know somebody who needs the encouragement to keep going when all they seem to come across are setback. Sending this ecard to a business associate of colleague could be just the nudge they need to keep focussed and keep trying. Add a personal message to say the things you don't feel you can tell them face to face. What does your business do at Christmas time when it comes to sending well wishes to clients? If you’d like to consider e cards then pop over and see what our business holiday ecards can do for you.